Spring has finally arrived: the sun is out this week, and rhubarb has been spotted — and picked through and procured — at the Union Square Greenmarket. “O, frabjous day! Callooh, callay!” she chortled in her joy. But what to do with these nearly neon pinky-green, celery-like stalks? Especially when trucked-in, beat-up strawberries are still upwards of $6 or $7 at the supermarket? 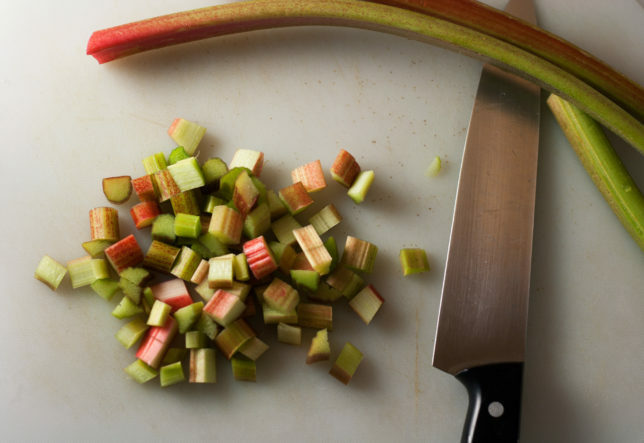 Can rhubarb stand alone? The answer, unabashedly, is yes. And with a sweet, crackly, crumbly crisp envelope and a touch of orange, they shine as brightly as that sun out there. Let’s get one thing out of the way: rhubarb is weird. It’s a vegetable masquerading as a fruit. Its leaves are poisonous, and it’s alternatively been described as bracingly bitter, sour, and tart when raw — a conclusion I could attest to last year when I tried a bite for the first time while preparing my strawberry rhubarb crostata. The aroma, raw, is nothing to write home about: it smells vaguely plasticky. It’s not going to draw your nose like a bushelful of peaches or a basketful of strawberries. 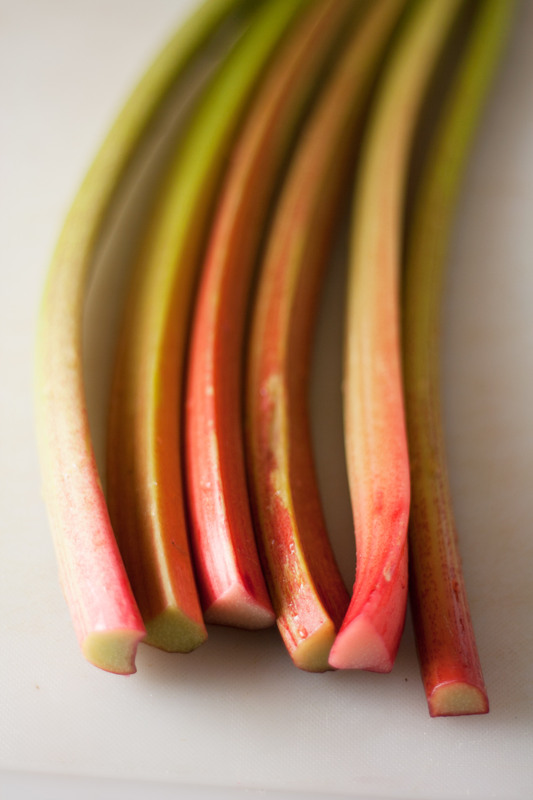 And yet, when combined with sugar, and maybe some aromatics like orange or lemon, rhubarb is transformed. It breaks down with heat like any other relatively crunchy vegetefruit (new word! ), and the tartness mellows and softens, yet still remains uniquely, well, rhubarb. In snack bar form, they’re addictive. I’ve done a riff on Smitten Kitchen’s strawberry rhubarb crisp bars, subbing the strawberry with double the rhubarb and double the sugar, tossing in some orange zest and juice, and adding a complementary sprinkle of cinnamon to the crisp base and topping. Deb mixes everything together right in the baking pan, but I wanted the rhubarb to sit and macerate for a bit longer to draw out its hidden sweetness, so I used a separate bowl for that. And then I lined my baking pan with a parchment sling to ease removal later, and I was worried the oats would get trapped under the parchment, so said whatever, I have dishes to do anyway, and mixed the crisp in another bowl. 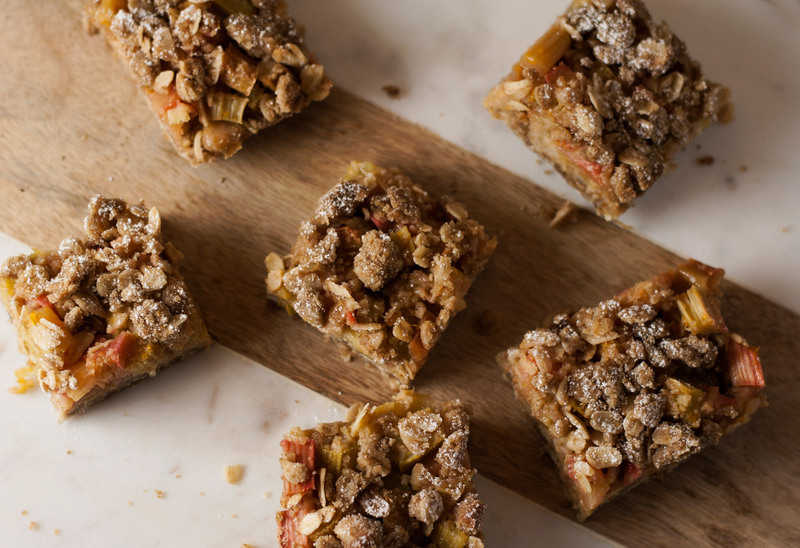 But the beauty in these bars is that the cookie-like base and the crumb topping are exactly the same, only one is pressed to create, essentially, a level floor, and the other is crumbled over the rhubarb middle: same flavor, slightly different mouthfeel. Sure, I used two extra bowls, but it was still as easy as making a sheet of brownies or a loaf of banana bread. And like banana bread, these bars are good for snacking, for dessert, for breakfast — made even more nutritious (and delicious) with a dollop of Greek yogurt. I felt pretty okay eating three straight out of the pan — and it took restraint not to dive in for more. It hits all the right notes: crunchy, sweet, tart, earthy yet bright. In Animal, Vegetable, Miracle, Barbara Kingsolver quoted Alice Waters: “Rhubarb is the vegetable bridge between the tree fruits of winter and summer.” Walk this crimson bridge with me here. 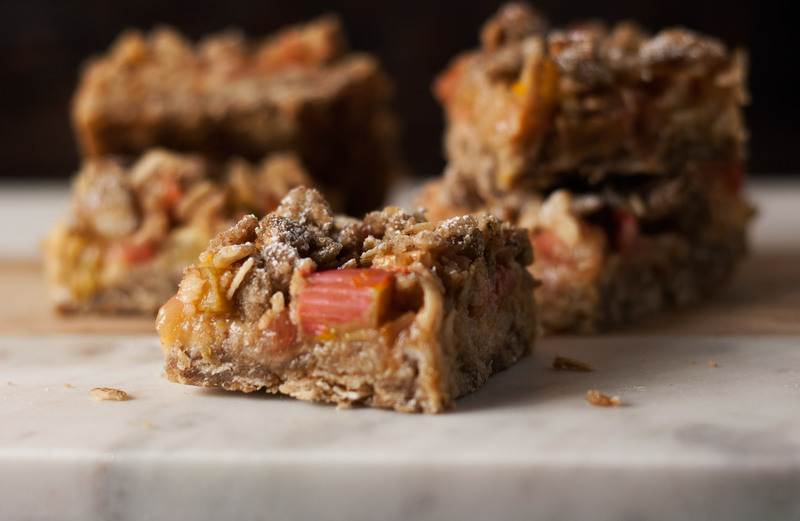 I promise you whole new horizons with these rhubarb orange crisp bars. Sweet summer is right at the other end. I used a pretty minimal amount of sugar here, as far as rhubarb is concerned. I’d say you can easily increase it to ¼ cup (4 tablespoons) without it being too sweet, but keep in mind that the base and topping are pretty sweet, so you might not want to go overboard. A note about measurements: I used the scoop-and-level method for measuring my flour and oats, and got more, in weight, than Deb Perelman did in the original recipe. If you don’t have a container that allows you to do this method, and no scale, I’d recommend keeping a closer eye on the texture and possibly adding the extra 2 tablespoons of flour that she recommends if the mixture is too wet. Preeat oven to 375 degrees. 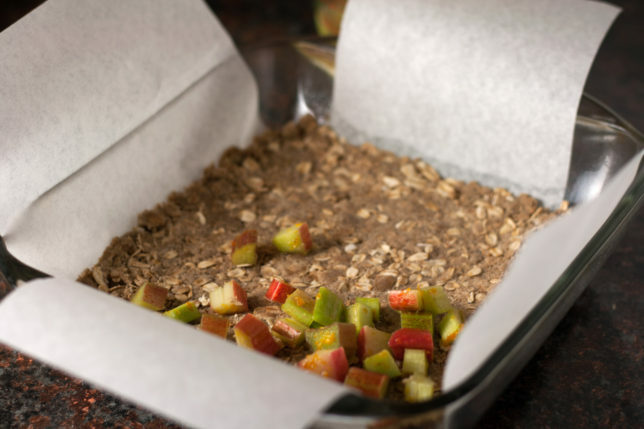 Line an 8 x 8-inch baking pan with parchment to form a sling. 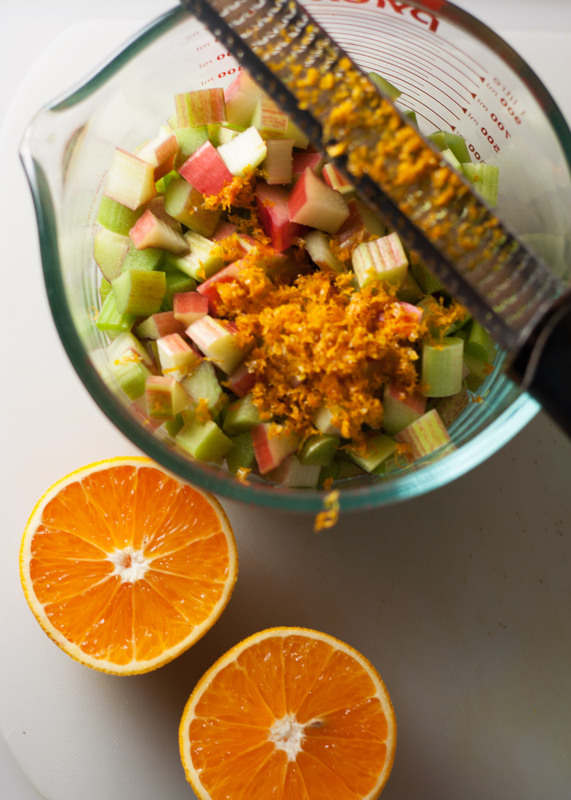 In a medium bowl, combine rhubarb, corn starch (if using), orange zest, orange juice, and granulated sugar. In a separate bowl, combine oats, ¾ cup flour, brown sugar, salt, and cinnamon, and stir until combined. Add melted butter and stir until clumps form. If the clumps feel soft or look overly damp, add remaining 2 tablespoons of flour. Set aside ½ cup of this mixture, and press the rest evenly into the prepared pan. 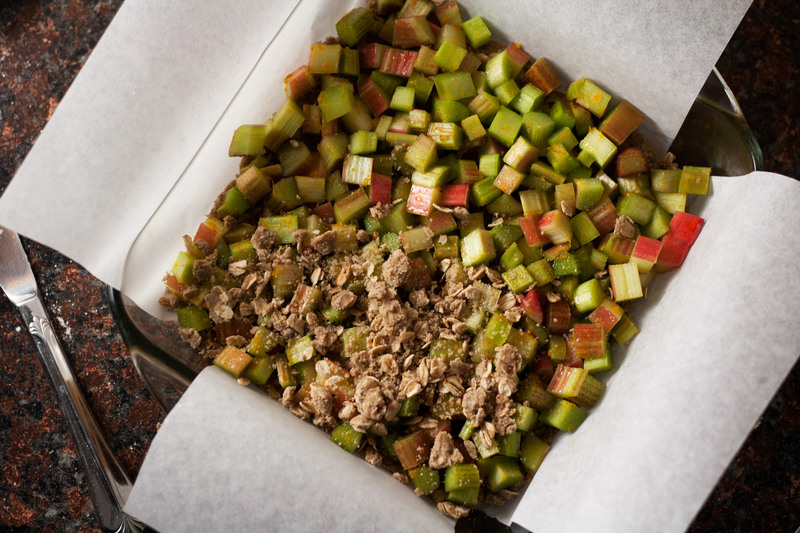 Spread the rhubarb evenly over the top, and then scatter the reserved crumb mixture. Bake for 30-40 minutes, until the fruit is bubbly (will be less so if you use cornstarch) and the topping is crisp, golden, and fragrant. Let cool in the pan before cutting — putting it in the refrigerator will speed this process and make it easier to cut. Cut into squares, sprinkle with powdered sugar if desired, and store leftovers in the fridge.